Friday the 13th the conditions looked great for a good hatch on the lower river: total overcast, intermittent snow and NO WIND! My client hooked a couple of fish on BWO nymphs and caddis pupa before noon, including a chunky brown that escaped by spitting the hook.. About 1:00pm the BWOs started to hatch in small numbers. He caught a couple of small ones, including the only fish we saw rise. By 3:00pm the bugs were everywhere, the wind had picked up and there were very few rising fish. Using a Parachute Adams as an indicator and a small BWO nymph underneath, we were fishing a small seam where we had seen a couple of fish “flash” as if they were eating nymphs. 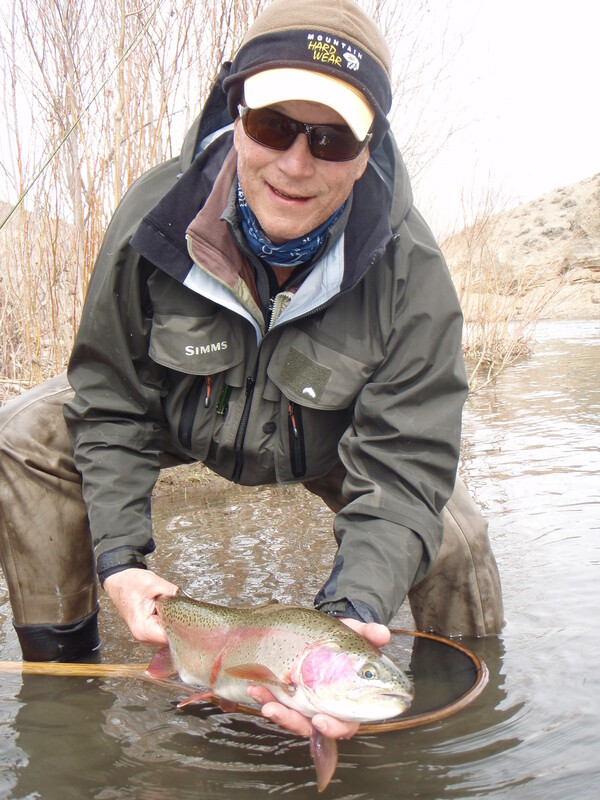 On about the 15th drift, a 23″ rainbow ate the dry. After a great fight, the beauty was landed. Congratulations Tyler. Fantastic fish!!! !